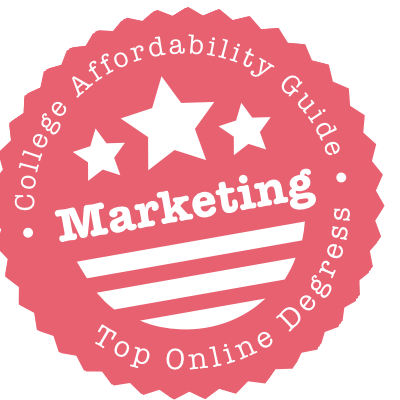 Scroll down to see the top not-for-profit colleges offering marketing degrees online. Appalachian State's BS in Communication, Advertising is a degree completion program for students who can transfer in at least 50 credits. The program, which has a fall start date, asks students to choose a Business or Creative emphasis. The former includes coursework on planning, organizations and sales; the latter covers graphics, media publishing and copywriting. Additionally, the degree requires students to take a minor - either Business or Sociology - both of which are available online. The capstone Communication course tasks seniors with undertaking an advertising campaign. Baker College has an online program leading to a Bachelor of Business Administration in Marketing. Students take part in team projects with classmates as they gain skills in areas such as advertising, retail, and product development. Students in this program also must complete two structured work experiences, each requiring at least 120 hours of field experience. To earn this degree, students take 54 credits in core business classes, 36 credits in the marketing major, and 30 credits in general education courses. Benedictine University offers marketing concentrations in both its online MBA program and its online Bachelor of Arts in Management program. MBA students can choose a concentration in marketing management or in internet marketing. Internet marketing majors take classes in social media, search engine optimization, conversion optimization and web analytics. Marketing management majors study consumer behavior, marketing strategies and marketing communication. The online MBA program has six start times a year, and students can take one course at a time or accelerate the program by taking two courses at a time. B.A. students who choose the marketing concentration take courses in consumer behavior, promotional strategies, internet marketing and international marketing. Undergrads may transfer up to 90 credits. Boston University has an online Master of Science in International Marketing Management program that was designed in conjunction with leading universities from around the world. Students can take online classes offered by Boston University's international partner universities; all classes are taught in English. Master's candidates also have the opportunity to collaborate with students from other universities using online tools. To earn the degree, students must take six core course, two specialization courses, two international business courses, and two electives from an approved list. Students gain marketing skills such as web design, search engine marketing, email marketing, and marketing analysis. Boston University ranked #6 in Best Online Business Programs in the 2016 rankings by U.S. News & World Report. Coastal Carolina University has an online program leading to a Bachelor of Science in Marketing that is offered as a degree completion program. Students who have an associate degree or have completed general studies requirements can take their upper level business classes through Coastal Online. Classes in the marketing program cover topics such as market analysis, marketing research, and marketing strategy. Most of the classwork is asynchronous, but courses might include a few synchronous events each semester when students are expected to be online at a specific time. The content of online courses at Coastal Carolina meets the standards set by Quality Matters. Students interested in marketing can earn a bachelor's degree with a marketing or public relations focus through Columbia College's online program. Students have a choice of a Bachelor of Arts or Bachelor of Science in Business Administration with a major in marketing or a major in public relations and advertising. The 120-credit program includes about 40 credits in general education requirements, 51 credits in business core requirements, and 18 to 21 credits in marketing. Columbia's courses are offered in eight-week terms, with five terms each year, starting in January, March, June, August and October. Classes are offered in an asynchronous format so that students can access the material at a time of their choosing while meeting weekly deadlines. Online marketing programs are available at the undergraduate and graduate level through East Carolina University. The undergraduate Bachelor of Science in Business Administration with a concentration in marketing is a bachelor's degree-completion program for students who have already completed an associate degree. Graduate students can earn a certificate in marketing completely online. They can pursue the marketing certificate as a stand-alone credential or use it as an optional add-on to customize the online MBA. The curriculum for the marketing graduate certificate requires students to complete four courses, mostly marketing electives. Students who already have an associate degree or 60 college credits may be eligible for the Fashion Institute of New York's online Bachelor of International Trade and Marketing. This degree-completion program is the only such program in the country with a focus on the fashion industry. Faculty and students come from all over the world, and students have the option to study abroad in a practicum class. Students can also work an internship with an international company for credit and can take part in extracurricular activities such as the International Trade Students Association. Students interested in marketing can finish the last two years of work toward a Bachelor of Business Administration in Marketing through the online degree-completion program offered by Florida Atlantic University. Applicants to the program should have completed all lower-division coursework, which means they must have earned at least 60 credits, including seven pre-business foundation classes. They must also have a minimum 2.5 GPA and be proficient in a foreign language. For example, students with an associate degree have usually met the enrollment requirements. The online degree-completion program requires 51 to 60 credits, including 30 credits in core business classes and 15 credits in marketing major courses. Students may enter the program at the start of any term. Florida International University offers a fully online program leading to a Bachelor of Business Administration with a concentration in marketing. Overall, the degree requires 120 credits, including 21 credits in lower level pre-core classes, which cover topics including computer applications for business, accounting, economics, and statistics. The college requires 27 credits in core business classes and 21 credits in the major. Courses in the major cover topics such as marketing research, marketing strategy, and personal selling. Classes are offered in an asynchronous format, allowing students to access coursework at the times that work best for them as long as they meet set deadlines. Fort Hays State University's Virtual College offers undergraduate and graduate programs in marketing. To earn a Bachelor of Business Administration in Marketing, students must complete 27 credits in core business courses, 15 credits in core marketing classes, 12 credits in a marketing concentration, and six credits in marketing related electives. Marketing concentrations are offered in Business Development and Sales, Digital Marketing, or General Marketing. Students in the online MBA program can specialize in marketing. MBA students must earn 25 credits in core courses and nine credits in the specialization. Students whose undergraduate degree is not in business must first take 12 credits in business foundation classes. Online classes at Fort Hays are asynchronous to give students flexibility. Franklin University has online programs in marketing at the bachelor's and master's levels. The Master of Science in Marketing and Communication is a 40-credit program. Required courses cover topics such as marketing communication essentials, behavioral research, digital marketing strategies, metrics and analytics, planning, and leadership. The program ends with a capstone project in which students apply their knowledge to a real-world situation. Franklin also offers a Bachelor of Science in Marketing and a B.S. in Internet Marketing, and students who already have a bachelor's degree can earn a subsequent bachelor's degree in either of those fields. Courses in the Internet Marketing program cover topics such as social media marketing, search engine marketing, cyber law, and graphic design. Golden Gate University offers a variety of online programs in marketing, including undergraduate and graduate degrees and certificates. Programs that can be completed entirely online include a Master of Science in Marketing, Master of Science in Integrated Marketing Communications, and an MBA with a marketing concentration. Coursework for the degree in integrated marketing considers business-to-business and business-to-consumer marketing using traditional and digital media. Undergrads can choose a concentration in marketing when pursing a Bachelor of Arts in Management or a Bachelor of Science in Business. Graduate certificates that can be earned online include Integrated Marketing Communications, Marketing, and Public Relations. Students can also earn an undergraduate Certificate in Marketing entirely online. Kennesaw State University offers an online Bachelor of Business Administration in Marketing. Classes in the program balance marketing theory with practical applications to prepare students for real-world situations. Required courses in the major cover topics such as consumer behavior, professional selling, marketing research, marketing management, and international marketing. Students have a choice of some elective classes in the marketing field, and not all of those electives are currently available as web-based classes, although online students have access to online electives in topics such as entertainment marketing, social media marketing, sports marketing, and hospitality and tourism marketing. Most online classes are asynchronous. Massasoit Community College offers an Associate of Science degree in Business Administration Careers - Marketing that can be earned online. Full-time students can complete the degree in two years. To earn the degree, students must complete 62 credits and take 20 classes. Students in the marketing program take general studies classes and general business classes in addition to marketing classes. Business classes include accounting, business law, computer business applications, and economics. Classes related to marketing include principles of marketing, advertising, sales, and retailing. All classes needed to earn the degree are offered online, but students might have to take proctored exams or might need to visit campus for registration and student services. Metropolitan State University has an online option for students who want to earn a Bachelor of Science in Marketing. In addition to general education requirements, the College of Management requires students to earn 22 credits in foundation courses such as statistics and accounting before they can take upper division courses. Students must also earn 24 credits in core business courses and 24 credits in marketing courses. Marketing majors take classes in topics such as marketing research, consumer and professional buying behavior, international marketing, and integrated marketing communications. Online classes allow students to access course material at the time and place of their choosing and interact with fellow classmates through discussion forums. Students with some college credits can complete a Bachelor of Business Administration in Marketing through the online degree-completion program that New Mexico State University offers. The classes offered online are the upper level business courses typically taken during a student's junior and senior years. To enter the program, students must have completed freshman and sophomore year coursework at a community college. Applicants should have already completed most general education courses and basic business courses such as accounting, economics, and information technology. Students in the marketing program take business core courses as well as required and elective courses in marketing. Required courses include marketing research and marketing strategy. Most marketing electives are offered online at least once a year. Northern Arizona University has a Bachelor of Business Administration with an emphasis in marketing that students can complete online. Students need to complete at least 36 credits in core business classes plus at least 24 credits in the marketing emphasis. The BBA with an emphasis in marketing is a professional program, and before students can enter it, they must complete first-year composition, a course in algebra and one in calculus, and seven lower-level business courses. Students with an associate degree from an Arizona or California community college have satisfied the liberal studies requirements already when they transfer to NAU. Northwest Missouri State University has an online bachelor degree-completion program for students who earned an associate degree from a community college. The program, which can be taken entirely online, leads to a Bachelor of Science in Marketing. Northwest Missouri has articulation agreements with many community colleges to ensure that the transfer of credits happens seamlessly. Marketing majors take a variety of core business courses as well as courses in the major covering topics such as marketing research, consumer behavior, and sales management. Marketing majors have the option to take part in real-world-based experiential classes, work an internship, and participate in study-abroad experiences. Courses are usually asynchronous and follow the traditional semester calendar. Northwoods University's online Bachelor of Business Administration program offers a major in marketing. The online program is designed for adult learners and offers multiple start dates throughout the year. Adult learners at Northwoods may be eligible to receive college credit for work and life experiences through the use of a prior learning assessment. To earn the bachelor's degree, students must complete 123 credits, including general education requirements. Classes within the major cover topics such as marketing research, consumer behavior, e-commerce, international marketing, sales management, and principles of selling. As part of the curriculum, students work alone or with classmates to create and present marketing plans to real clients. Students interested in marketing can consider two very different programs that Oklahoma State University delivers through its online OCampus. The Graduate Certificate in Marketing Analytics requires students to complete two core courses and two electives, allowing students to customize the program through their chosen electives. Applicants must have a bachelor's degree in any field with a 2.5 GPA and at least two years of professional experience. The Master of Science in Design, Housing, and Merchandising: Retail Merchandising Leadership, is a collaboration of the Great Plains IDEA collaboration and Oklahoma State. This is a 36-credit program, with most students taking one or two courses per semester and finishing in three years. Ozarks Technical Community College offers an Associate of Applied Science in Business and Marketing in a fully online format. Students can also earn a Certificate in Business and Marketing online. The A.A.S. degree is designed for students who want to learn skills that they can use to enter the workforce and might not be the best choice for a student who plans to transfer to a four-year college to complete a bachelor's degree. Classes in the major cover basic business concepts such as accounting, management, business law, strategy, and principles of marketing. Students have the option of performing an internship or co-operative education experience. Credits earned for the certificate might apply toward an A.A.S. St.Joseph's University offers two highly specialized graduate marketing degrees online. The Executive Food Marketing MBA, which the Haub School of Business has offered for 25 years, is the only such program in the world. The program consists of 18 two-credit courses covering traditional MBA topics as well as specialized topics such as food marketing strategy, international marketing, food retailing, market segmentation, and new product planning. The Haub School of Business also has an online Pharmaceutical and Healthcare Marketing MBA for Executives designed for students working in industries such as biotech, medical devices and pharmaceuticals. The program requires students to complete 24 two-credit courses, with each course presented in a one-month format. Students may enter the program at any time. St. Leo University offers a variety of online programs for students interested in marketing. Options includes a Bachelor of Business Administration with a specialization in marketing, an MBA with a concentration in either marketing or marketing research and social media analytics, or a graduate certificate in marketing on in marketing research and social media analytics. Courses required for the marketing concentration or certificate cover topics such as brand management, e-marketing, global marketing, sales management, and new product development. The marketing research and social media analytics concentration or certificate covers topics such as data mining, gamification applications in marketing, social media marketing, and research. The MBA requires 36 credits, and the graduate certificates require 18 graduate credits. Southern New Hampshire University has a large number of online programs related to marketing, with options for students from the associate to the graduate level. Undergrads can earn a Bachelor of Business Studies with a concentration in Marketing; a Bachelor of Science in Marketing that offers a concentration in Social Media Marketing; and an Associate of Science in Marketing. At the graduate level, SNHU offers an International MBA with concentrations in Internet Marketing, Marketing, and Social Media Marketing. A program leading to a Master of Science in Marketing is also offered online. The online MBA program has concentrations in Marketing and in Internet Marketing. Students can also earn an online graduate certificate in Marketing or Social Media Marketing. The Master of Science in Agricultural Communications at Texas Tech prepares graduates for jobs in marketing, public relations, and mass media. These specialization areas are available with the cooperation of the College of Media and Communications. This 36-credit degree is offered completely online, and students can choose a thesis or non-thesis option. The curriculum requires 18 credits in a communications core, 12 credits in a research core, and additional courses in a support area, such as marketing, public relations, or advertising. Applicants, who must submit GRE scores, should have a bachelor's degree in a field such as agricultural communications or public relations. You can enroll as a full-time or part-time student. University of Illinois provides grad students with two paths to a marketing degree. The first is an MBA with an advanced specialization in Digital Marketing. Enrollees take three courses plus a capstone in all four core specializations: strategic leadership and management, managerial economics and business analysis, value chain management, and financial management. They then take three required courses and a capstone in Digital Marketing and one other focus area. An alternative degree is the Master of Science in Strategic Brand Communication, a 15-month joint program from the College of Business and the College of Media. Coursework explores strategy, branding, consumer behavior and management. Unlike the MBA, there's only one capstone and students do not need managerial experience to apply. The University of Maryland's online University College offers an online program leading to a Bachelor of Science in Marketing or a Master of Science in Management with a specialization in marketing. Classes in the undergraduate program cover topics such as integrated marketing communications, managing customer relationships, consumer behavior, marketing research, sales management, global marketing, digital marketing, and marketing nonprofits. Students must earn a total of 120 credits including general education requirements to receive the bachelor's degree. The master's program requires students to take four core management courses and seven courses in marketing. They must also complete a strategic management capstone. UMUC offers multiple online course sessions each semester, so students have great flexibility in scheduling classes. The Bachelor of Business Administration at UMASS includes a field of study in Marketing. In addition to general education and core business courses, students take four upper-level marketing courses, one of which must be Marketing Research. Electives drawn from programs such as Sport Management and Accounting allow for further specialization. The online MBA - ranked 12th best by U.S. News & World Report in 2017 - also has a Marketing focus. Students choose three courses in the discipline from a sizable list, plus 11 required core business courses. (There's no capstone or thesis.) Although preference is given to applicants with field experience, enrollees without a business background can get up to speed with foundation courses in accounting and finance. The University of Memphis offers a Bachelor of Business Administration in Marketing Management through its UofM Online program. The degree can be completed entirely online. To earn the degree in marketing management, students must complete 41 credits in general education requirements, 42 credits in business administration requirements, 24 credits in the marketing management major, and 13 elective credits. Online classes at UofM are usually asynchronous, giving students flexibility in when they log in to do coursework. However, some classes do have components that require students to be online at a set day and time for videoconferencing or other events. Some classes may require an on-campus orientation session. UIW Online, the distance learning arm of the University of the Incarnate Word, offers a Bachelor of Business Administration program that allows students to specialize in general marketing or social marketing. Students choosing either specialization must complete 46 credits in core requirements and 39 credits in business core requirements, plus classes in the major. General marketing majors take required courses in public relations, social media, consumer behavior, and market research. Social marketing majors also take classes in internet marketing and web analytics. UIW Online is designed for adult learners, which the university defines as people who have been out of high school for at least five years and who have three years of full-time work experience. UWW's Bachelor of Business Administration with a major in Marketing includes 24 credits in the major, as well as a well-rounded assortment of finance, management, economics and accounting coursework. With a healthy helping of courses placed online for the winter and summer terms, students should always be able to find the BBA requirement they need. At the graduate level, the school's 36-credit online MBA features an emphasis in Marketing. It's an attractive option, given UWW's top-20 ranking in U.S. News & World Report's 2018 list of Best Online MBA Programs. Neither degree requires a thesis or internship. Webster University's online MBA program allows students to specialize in marketing. The MBA requires 37 credits by itself or at least 49 credits with the classes required for the marketing emphasis. Three classes are prerequisites for the MBA program, including a course in accounting and one in economic analysis. Applicants who completed those classes more than five years ago may take a waiver exam. Classes in the marketing emphasis cover topics such as marketing channel management, promotional management, marketing statistics, international marketing, and marketing research. Classes are offered in an asynchronous format, giving students 24/7 access to coursework. Western Governors University offers an online Bachelor of Science in Marketing Management. The program allows students to move through the required coursework at their own pace as long as they meet the required minimum. Students who enter the program with an associate degree typically finish the program in about two years. Students who enter without many college credits typically finish in four or five years. Most of the coursework is set up so that students can choose when and where to study. Applicants who do not have an associate degree are required to take an online readiness test as part of the admissions process. Students seeking a career in marketing have a choice of several degrees that can be earned entirely online through WilmU Online, the online arm of Wilmington University. Graduate students can earn an MBA with a concentration in marketing management, which prepares students for a career in product management, sales management, or advertising. A second online graduate degree option is the Master of Science in Management with a concentration in marketing. Either online master's program requires 36 credits. Undergrads can earn a degree in marketing or a Bachelor of Communication with a concentration in integrated marketing communication. Wilmington also has online programs leading to a certificate in marketing or in digital marketing. Each undergrad certificate requires five courses. Enrollees without an undergraduate business background start the online MBA at Xavier University by taking foundational courses in accounting and statistics. They then jump into the 27 core credits, which encompass finance, law, economics, information systems and management. Students are required to take an international business course but can instead get credit for a structured trip abroad. The program mandates nine elective credits, and students can pull courses from the traditional MBA's concentration in Marketing. Although not all concentration courses are online, those that are should cover most interests, from multinational marketing to new product rollouts. Students wrap up the program with a capstone titled Global Strategic Thinking. Whatever you do, avoid schools with low completion rates and high student loan default rates.